Say what you will about the relative merits of cites versus suburbs, cities can be interesting places where you can sometimes see the unexpected. Suburbs, not so much. So, a few weeks ago, I noticed something seemingly amiss at the site of the former Bordens milk factory along the Morris and Essex rail line, which I ride to work on occasion. This site was abandoned by Bordens long ago, and after changing hands several times, it is now used by the City of Newark and the Newark Police Department to store and repair some of their many vehicles (there also appears to be a horse training ring for use by the Police mounted squad). 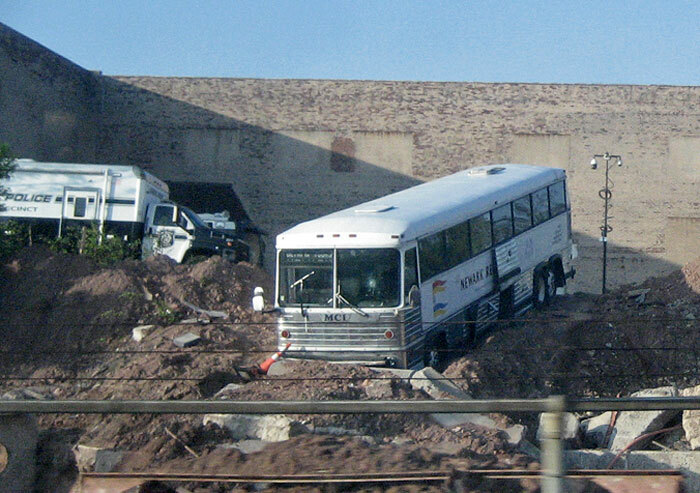 The object that seemed out of place was a bus, hanging over a small dirt cliff in the yard, nose down. The bus is marked for the Newark Recreation Dept. It’s not surprising that Newark Recreation wanted a bus to transport children and families to its various activities and offer occasional road-trips outside the city. 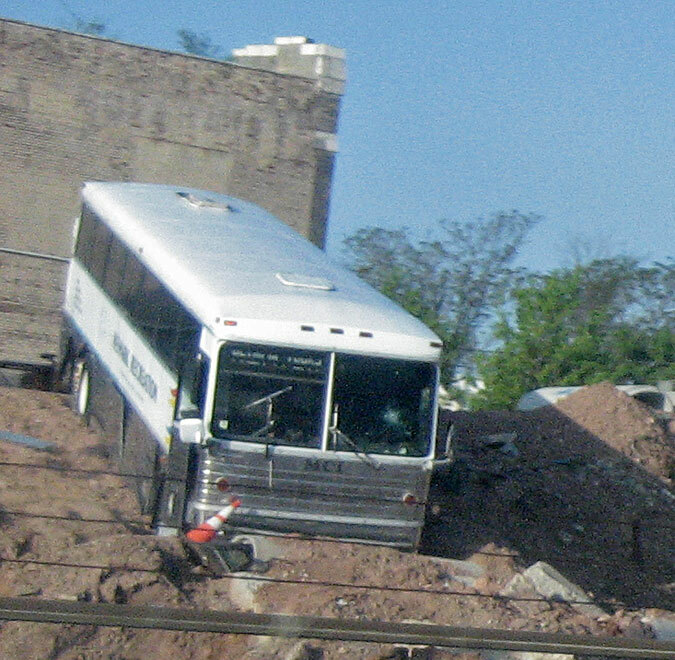 What is surprising is that the bus is not being used these days, because it’s stuck hanging over a cliff at the former Bordens facility. How did this happen? Was it an accident? If not, what would inspire city personnel to leave a bus this way? Was it still usable? And what about that bullet-hole on the front windshield, drivers side? I have not read or heard any explanation for this situation. So I’m just going to share it here, as another example of our cities providing spice to life; they give us unexpected flavors now and then. I’m sure that this bus is somebody’s headache; but it’s not yours nor mine, so for now, just enjoy! Jim, That bullet hole looks like it hit the driver, which may not be something so enjoyable. And if it’s for transporting children and families to fun times somewhere, even more so is the bullet hole a bad sign. I saw a couple of bullet holes in a car next to me at a red light not too long ago. I must say it did not give me a good feeling to see that.